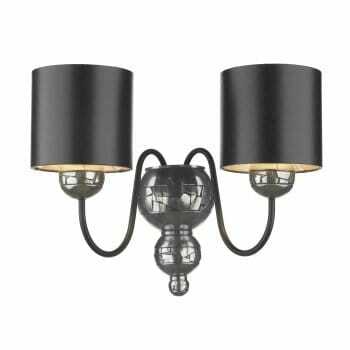 David Hunt Lighting British made Garbo 2 light wall fitting in pewter finish with black silver shades features a metal pewter finish frame with marble style decoration. The product code for this David Hunt wall fitting is GAR0921. The Garbo collection's stylish and modern design will be a charming addition to any suitable room. A 15 multi-arm ceiling fitting, a 9 multi-arm ceiling fitting a 6 light ceiling fitting and a single light multi-arm wall fitting are also available in this finish. The Garbo range is also available in bronze finish.